Research has proven that engaging seniors in brain-stimulating activities such as memory games and strategic puzzles – an everyday activity at Aegis Living communities – can help slow the progression of cognitive decline. A new study published in the Journal of the American Medical Association Neurology found that individuals who spent a lifetime taking part in brain games for memory and continue to exercise their minds later in life may have a better chance of preventing memory loss. According to HealthDay, even if someone had low professional and educational achievements, having a life filled with reading and playing games and music can be beneficial. Researchers included about 2,000 individuals between the ages of 70 and 89 who were part of the Mayo Clinic aging study between 2004 and 2009. Approximately 1,700 participants were considered cognitively normal, and the remaining 300 experienced mild cognitive impairment. The team also examined the education levels and occupational activities of the participants and asked them to complete questionnaires on common intellectual stimulation and how often they took part in mentally stimulating activities in the past year and during middle age. Researchers looked to see if participants carried the APOE4 genotype, which may increase the risk of Alzheimer’s disease, as well. At the start, cognitive function was lowest in APOE4 carriers and people who had scored the lowest job, education and activity measures. The doctors also found that men and older individuals had lower scores. However, participants carrying APOE4 who ranked higher in terms of lifetime mental engagement experienced a delay in dementia risk by 9 years, and all participants who regularly took part in intellectually stimulating activities during middle age and later in life, regardless of professional and educational background, saw a drop in their dementia risk. 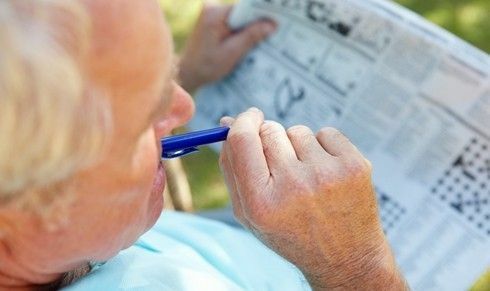 “We knew that lifetime intellectual enrichment can delay the onset of cognitive decline, but here we were able to estimate how much it helps you,” Vemuri told Reuters. Enhancing the quality of everyday life while promoting cognitive function is a primary goal at Aegis Living. All Aegis communities have Life Enrichment programs that use scientific research to enhance brain fitness. The Life Enrichment director of each assisted livingcenter uses this data to determine what types of cognitive health activities are best suited for his or her particular community, taking each individual resident’s needs and abilities into consideration. The Life Enrichment approach to brain fitness goes far beyond the typical game of bingo. It provides seniors with Mind Stretchers puzzles, crosswords, Scramble Squares, memory exercises and brain games, as well as offering poetry and travelogues to keep seniors engaged and mentally active. Additionally, the life enrichment program involves encouraging seniors to learn new hobbies, take part in friendly competitions with other residents and take up an instrument, among other activities. Aegis Living also strives to keep residents informed in current events to keep them intellectually stimulated. For example, residents are urged to begin their mornings by taking part in the News and Views gathering, which gives an engaging look into each day’s local, national and international news. Aegis Living also hosts TED Talks, which allow seniors to explore important current events and have intriguing, substantial discussions with Life Enrichment leaders as well as each other – just one of the many ways Aegis Living works to strengthen brain health.